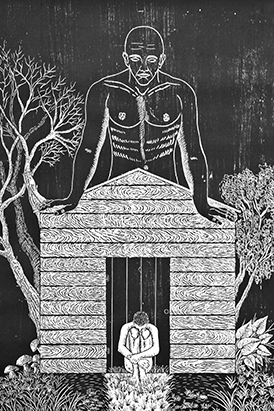 Aliosky García Sosa’s woodcut print “Tu Propio Cielo” (Your Own Sky). From the May 2016 Desktop News |When art and art history assistant professor and printmaker Sarah Marshall went to Cuba for the first time, she was there to make books. But when she saw the talent of the traditional printmakers there, she wanted to bring that influence back to the states—helping the Cuban printmakers build a name for themselves internationally while exposing the UA community to new artists and styles. The result of her efforts was the first-ever exhibit of Cuban printmaking at the Sella-Granata Art Gallery on UA’s campus. There, the Department of Art and Art History showcased the works of various artists, but particularly the work of relief printer Aliosky Garcia, a professor and the director of the printmaking studies program at the Instituto Superior de Arte, Universidad de las Artes in Havana, Cuba.  Marshall was first invited to Cuba in 2006 by Steven Miller, a book arts professor in the School of Library and Information Studies, in order to collaborate on the printing and binding of a bilingual book of poems by poet laureate Billy Collins. “I took Marshall to Cuba because I had been so excited by the Cuban artists’ traditional techniques, and I wanted her to see the kind of studios they use and to catch the energy there,” Miller said. According to Miller, the embargo on Cuba has preserved the traditional methods of printmaking for more than 50 years. “The technology hasn’t changed,” he said. “There has been no overtaking of art-making processes by computers with advanced technology like laser cutting, so the tremendous traditions of historic printmaking still stand. After the initial project, entitled Noche, was complete, Marshall returned to the States and began planning her next trip to Cuba, which would be a sabbatical to create her own work. But in addition to working on her own pieces, Marshall also became friends with local artists and began to buy beautiful, colorful prints for her own collection. Marshall selected dozens of prints to bring back to UA. Many prints came from her own collection, purchased from artists at the Taller Experimental De Gráfica in Havana. With curatorial help from local artist and Instituto Superior de Arte professor Gustavo Del Valle, she chose other prints to borrow from her counterpart in Cuba, Aliosky Garcia Sosa. His work, which largely depicts the human form, is first carved into wood blocks and then printed on thick, durable paper in black and white. “He deals a lot with the human condition,” Marshall said. “So the prints are very metaphorical, and often the figures will have multiple heads or limbs to represent multiple viewpoints or conflict within a single person. Though the exhibit is no longer on display at the Sella Granata art gallery, Garcia and two other Cuban artists will be visiting the University October 23-29 for the campus’s annual Cuba Week to showcase their work, give lectures, and continue to collaborate on new pieces.